The first time I saw this old 1978 Ford F250 a friend of mine came by as we were preparing for Inman Farm Heritage Days a couple of years ago and offered to sell it to me. I was stretched pretty thin at that point and passed on buying it even though the price was right, mostly due to the fact that it would barely run. The next thing I know, my friend Frank Carden bought it. Like a few of Frank’s other projects, this one wound up here. I tried all the easy stuff like new spark plugs and cleaning the carburetor, but it still ran terrible and had no power. I did a compression check and only checked half the cylinders before I found three with poor compression. On top of that, the transmission leaked something terrible. But the dump bed worked great, so I saw lots of potential. 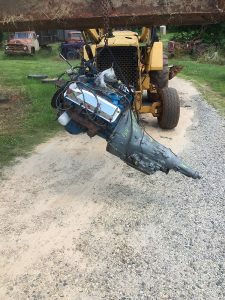 My next move was to go see my friend Oliver Gentry at his salvage yard in Newnan. I’ve known Oliver and his family for years through racing. They don’t come any better. His wife Beth and his daughters Olivia and Genna are Great Racers and great at it. If you don’t know of them, Google them and you’ll be impressed. Oliver is a real wheelman too on the local dirt racing circuit, with a slew of feature wins and track championships over the years. Like a lot of my projects I put this one on the back burner for a bit, but a couple of weeks back it was too cold and wet to work in the fields, so I got Joanne to help me push the truck into an open shed under the barn and I started taking the greasy old engine and transmission out of the truck. I almost had it done by suppertime that first afternoon. So as soon as I ate a bite, I went back to pull it out. It was all going really well until I removed the crossmember supporting the transmission. I assumed the exhaust pipes were connected all the way to the back. Bad call. As I knocked the crossmember loose I held the right side exhaust pipe up with one hand, assuming I could ease the whole assembly down at one time. But the sections of the exhaust weren’t connected, and as soon as it moved, the left side dropped down and whacked me up side the head. It knocked my glasses off, cut a gash next to my eye and left me with a really bad shiner for a couple of weeks. Other than that, everything went really smooth, so smooth that I began to worry that I’d done something wrong. Once I tightened the last bolt one morning, I did other things the rest of the day and waited ‘til right at dark to try to crank it. My fears were unfounded. The engine started right up and ran great. The transmission shifted smoothly. 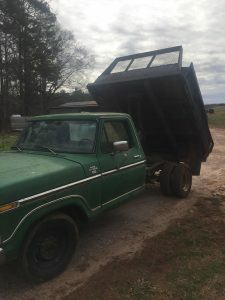 I got so carried away riding around the farm in it that I ran the truck out of gas. Luckily Joanne had seen me drive over the hill and brought me some fresh gas and I was able to drive it back home. Since I usually start out with projects that most folks would just send to the scrap dealer, there’s usually some blood, sweat and tears invested before I’m done. In this case, there were no tears, not much sweat and just a little blood. Now on to the next one – a 1963 Chevy C60 with a skipping engine, no carburetor linkage, rusty gas tank and no working clutch or brakes. I plan on being a little more careful this time. Rusty Relics: Back in action!